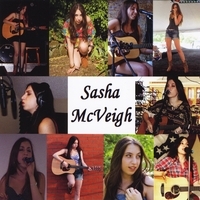 I was recently introduced to the music of British singer-songwriter Sasha McVeigh. Her debut self-titled EP was released in March 2013 and features six original tracks. She is also currently in Nashville in order to record her debut full length album (after a successful Kickstarter campaign) after having finished a short UK tour. Possibly the strongest track on the EP is Teardrops Fall. The intermittent male backing vocals blend well with Sasha's voice and the simple instrumentalisation allows the focus of the track to be on Sasha's vocals. The various instrumental lines (with acoustic guitar taking prominence) don't change much during the track however the track doesn't feel boring, feeling comfortable instead. No Strings Attached Romance has echoes of a blues influence that works really well, I would just personally like it see it really developed and played with. Even the lyrics play to a bluesy style with the idea of "what happens in Vegas stays in Vegas" and "you and me baby it was rock and roll crazy". As it stands at the moment the track is by no means a poor track, I just think it could be even better from pushing the blues influence, it would also give Sasha another dynamic to work with. The EP closes with I Should've Realised which in itself is a very strong track, unfortunately however it feels a little boring and slow after listening through the rest of the album and would benefit from a change of production. It is also, interestingly, the longest track on the EP at 4 minutes 45 long. Lyrically, however, it is very strong, with lines such as "you said one day we'd say I do, just a selfish lie to stop me walking out on you" complimented by Sasha's heartfelt vocals. Overall this EP is very strong and a good introduction to Sasha's music. She tours regularly throughout the UK so keep an eye on her website www.sashamcveigh.com! It will be interesting to see how Sasha's music develops with the upcoming release of her debut full-length album, she is certainly an artist to keep an eye on. Labels: Sasha McVeigh "Sasha McVeigh"